The phone itself has 64Mb of memory installed - this is not upgradeable. Although Nokia claims that it can store "2 hours of CD quality music", by my calculations that's not quire correct. Please note: Kb is kilobit, while KB is kilobyte. There are 8 bits in a byte, 1024 bytes in a kilobyte, and 1024 kilobytes in a megabyte. Once you start the Music Player, via accessing it through the normal 5510 menu or by pressing the Music key, you can select Options/Settings/Sound Style to choose from a list of Audio Enhancements. I currently have mine set to "Extra Bass" which makes up for the lack of bass in the normal settings. Some other options include Rock, Pop, Jazz and Dance. Of course there is the “Pause” control, which, yep! Pauses the playback. If you pause the song, the Navi-Key (the Big one right under the screen) changes to “Play”. The music stops when you get a call, other than that you can be listening to the music while you use the phone. Now: Getting the Audio onto the Phone. Yes, the stories you have heard are true. 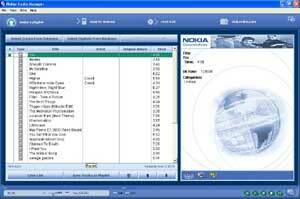 Nokia Audio Manager, the included "Music Management Software", is the possibly the worst peice of software I've ever used. I do believe it's the "Coded to a Deadline" version. Not only do you have to have to mess around with it to get it to work under Windows XP, it’s interface is very hard to use. Playlists, Databases....Nokia made a mistake with this one. They have tried to make it a complete Audio Management solution for your computer....when all you really need is a program to copy audio to your phone. I would be happy if the program just turned audio files (such as wave, mp3, it3 etc..) into LSE files, and I could copy them automatically. What would be even better is if the 5510 could play normal MP3 files. This is a good time to explain the great anti-piracy feature. The Nokia 5510 doesn't play MP3 files. It plays LSE files, which are created by NAM (Nokia Audio Manager) and "security encrypted for local use". Winamp, when instructed to load Creed - One.lse, loaded the ID3 tag and displayed "Creed - One" in the playlist, but refused to actually play the file. Not only will the 5510 only play LSE files, it will only play the ones that are copied to it using NAM. If you copy LSE files to the phone yourself using Windows Explorer (for example) it will not recognize them. I am assuming that NAM also copies a "playlist" to the phone, which includes the files that it can play. This little gem also has an inbuilt FM Radio! Press the 'Radio Button' hotkey (which is located on the bottom edge of the phone) and you get the Radio Menu. This Allows you to select station frequencies, name the station, rename it and save it. Radio reception is fairly good; it uses the headphones as an antenna. MP3 Playback and the Radio WILL NOT WORK without headphones plugged in. Without the 'Headset' plugged in, it'll beep at you and say 'Please Connect Headset' when you try to start MP3s/Radio. Any pair of headphones will do. Also, Both MP3 and Radio playback will not start if you have the USB cable connected to the phone. If you have MP3/Radio playing, and you connect the cable, the playback will stop.